Looking to add some elegance and class to your Lego creations? 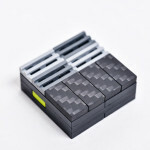 These carbon fiber Lego tiles are the perfect finish touch. Back them on Kickstarter to help make them a reality.